This is my second set of photos I am publishing on my easter trip. However, I would like to post on London first, then return to Bath on Friday for Sky Watch Friday. This is because I found that a lot of my photos taken in Bath have very nice skies. So those of you who are also Sky Watch Friday readers do tune in. At first when I was preparing my materials for London, I was thinking... Hmm... I presumed London would be well blogged about, and I pondered for quite awhile whether should I blog about it, but then I stumbled across an interesting topic that had always disturbed me. So I've decided to give it a go. 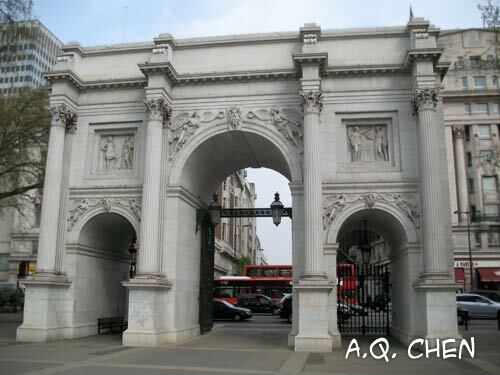 I think without the need of much introductory, most of you would have guessed that the photo above and the photo below are the Marble Arch, and the Big Ben with the London Eye to its left respectively. Then here comes the burning question which had been always disturbing me. I happened to see this in a souvenir shop next to the Tower of London; an armor suit. From the photo below, may I draw your attention to the groin area of the armor. Does anyone know the reason for that to be ahem... so hugely protruded? Please let us know. 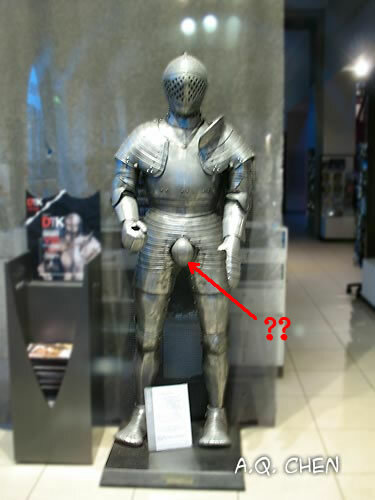 Here's a topic that you may want to blog about; is this specific to a English armor or is it a common component on most armor? Or is this just a copy used for display purposes? Because what is the use of designing that part protruding? I mean if you want to protect it, there are many ways of doing it. Could it be used as a tool to humiliate their enemies? Or could it be a symbol of bravery? Or may be it was just a fashion statement? What's your take on this? Anyone from the fashion industry? I would love to hear your opinion on this. Isn't that a cod piece? Alex: Maybe it is a more simple reason for it to be large. If the area was hit with a hammer type weapon the protuberance would collapse but no harm would be done to the Knight. This is an engineering rather than a fashion thought. Neat photos from England. A great set of shots. A cool set of armor! This is a hide for eastern eggs ! amazing trips you have here. i like your shot of the big ben. as for that knight, somebody might have robbed what has originally been there. thanks for dropping by eskapo. Fishing Guy: Engineering. That's the man! I could see why. Bends/curves are always stronger. Thus making it more firm, and the length can surely take the impact. Then again if you were wearing that, and if you hit by a hammer at that part from the front, surely your sides will hurt a lot. Looking at the photo that piece seems to be an attachment resting not on the armor, so a direct front impact will still hurt a lot. Fred the Mole: Ah... yes! dong ho: could be, but then, why replace it with that? Thanks for visiting my blog, I hoped you have enjoyed it. That is a hilarious photo! Maybe that style helped knights feel more masculine. London classic! Wonderful and very interesting photos, Alex. Don't bring back that knight to Malaysia hehehe..
Lovely to see London through your eyes. Never been to west part of the world. Been to "almost" every country in the east part of the world. Hope to kick off visiting the west part with London and Switzerland in my mind in a few years time. About the knight...hmmm....a funny talking piece for every visitors to the musuem..hahaha. But seriously I think when they are on the horse it is to protect them when they are using a kind of sword fighting the other knight on another horse charging at them. Just my guess. 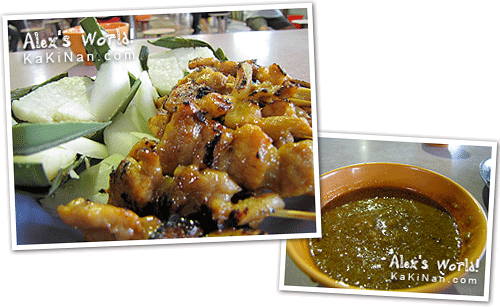 You might like to view my posting today for the new look of downtown east in pasir ris. Have a nice weekend, Alex. Maybe this particular knight was just a show off! 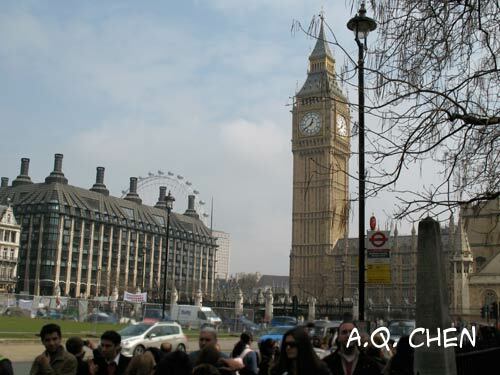 Alicesg: Now I feel that may be I should have blogged a bit more on London. Nice thought about the knight, but I still think that couldn't be the only reason. May be there was another style of fighting during those times that we aren't aware of. Anyway to conclude this discussion, I think most of us would agree that it was some form of protection. However, from our conversation, some of us thinks that it was overly done. Whether it was due to engineering, material sciences, or to portray a masculine image, I guess that can only be answered by those who came up with this design. If you still have any more suggestions, do send them in.